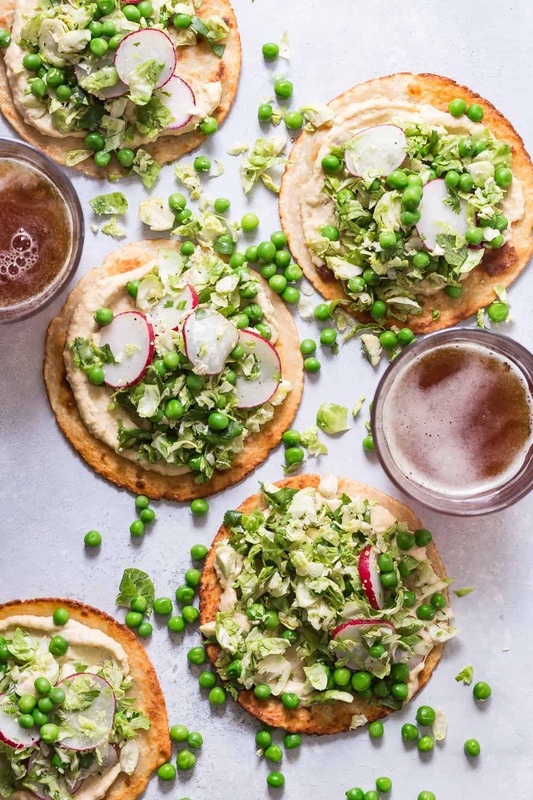 Tostadas topped with roasted garlic hummus, shaved brussels sprout and peas! This is a great idea for a light lunch or picnic at the beach. It’s amazing what the humble tortilla can do, let’s make tostadas guys! My favorite time for eating is right around the corner! Wait, I can pretty much eat anytime but summer is much more fun. It’s full of easy to make salads like this Grilled Chicken Quinoa Salad. It’s all about relaxing at the park watching a concert or lying on the beach until the sun goes down. Hummus is always in my fridge and I’m not complaining! It can be the perfect snack and tastes great with almost anything you want to use as a dip. But don’t forget that when you can use it as a spread, then it starts to become more hearty and can actually become an “Unofficial Meal”. You can throw it together and people will think you spent hours on it. It’s so easy! These tostadas are exactly that. A mini meal, easy to pick up and packed with fresh healthy ingredients and they’re vegetarian! Make sure to buy the really small tortillas, they’re about 3-4 inches wide. 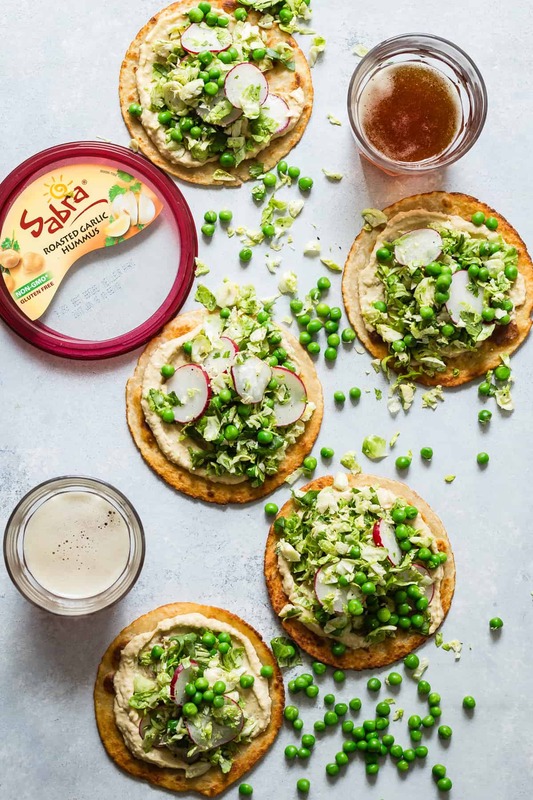 Gently pan fry them to get that crispy taste and spread some creamy Sabra Roasted Garlic Hummus on top. 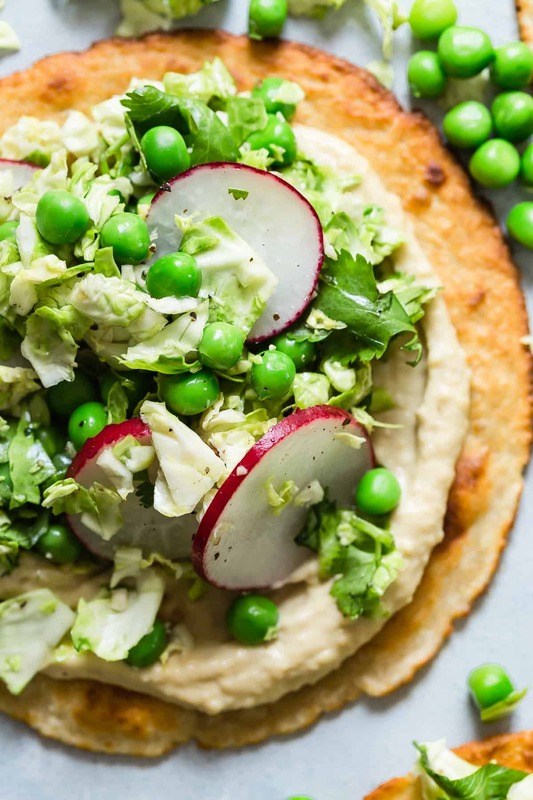 Add some shaved brussels sprouts, sliced radish and garden peas and you can call it a day. Seriously you just made this epic snack and it took less than 10 minutes! Use a pre-made pizza crust. Toast some pita bread rounds. Sliced zucchini, smaller but they’d make great apps. Giant leaves of butter lettuce, sort of like lettuce wraps. Happy summer friends! 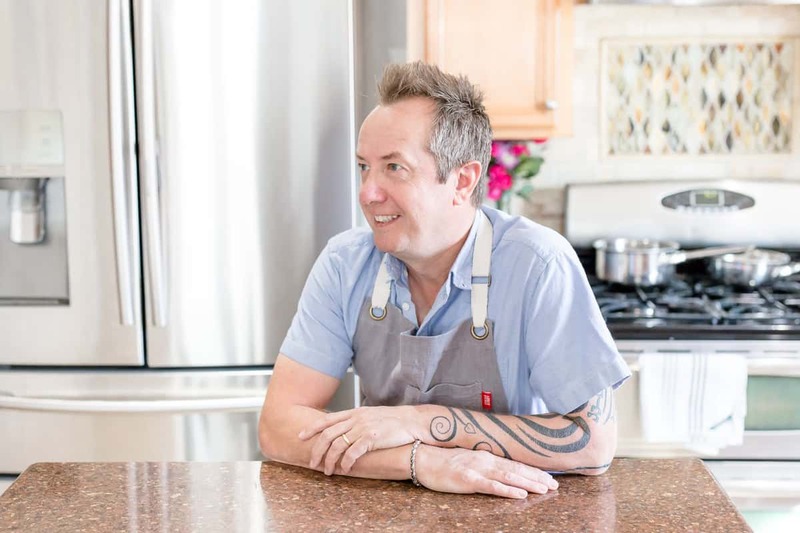 Let me know what your favorite summer snacks are! This post was sponsored by Sabra. All thoughts and opinions are my own! 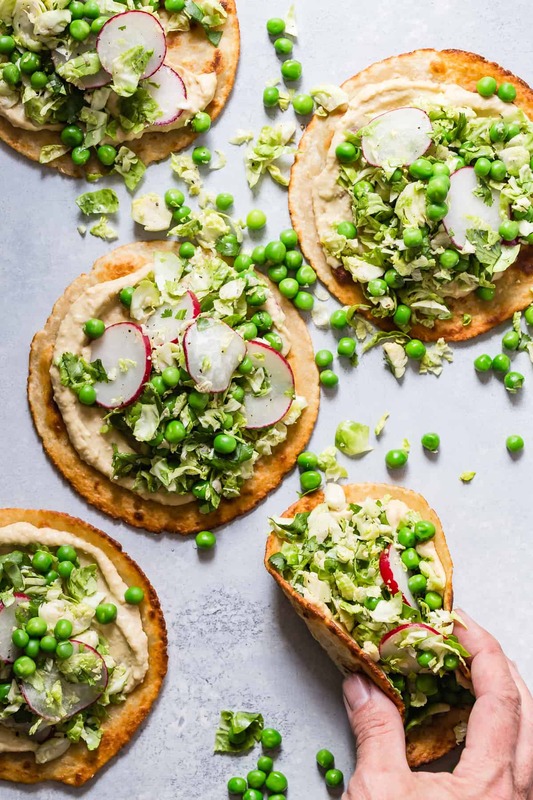 Crispy tostadas topped with creamy garlic hummus, peas, radish and brussels sprouts. In a non stick pan, heat the olive oil until quite hot. Place a tortilla into the hot oil and cook until slightly golden and puffy. Turn over and repeat on the other side. Transfer each tostada to a plate with paper towel on it absorb the grease. 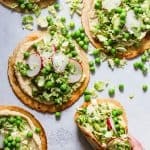 Spread each tostada with some hummus and top with sprouts, peas and radish. Garnish with chopped cilantro and season with salt and black pepper. This tostada is heatlhy and freshly delicious!